Flowering biology of Fraxinus ornus L.
Fraxinus ornus is an entomophilous (insect-pollinated) or anbophilous (both wind- and insect-pollinated) species of ash native to the central and eastern parts of the Mediterranean area, widely planted elsewhere as an ornamental tree and also cultivated on Sicily (Italy) for production of Manna. The deciduous tree is small, up to 15 m, and the flowering period in the Mediterranean area is April to May. The fragrant flowers consists of one pistil, two stamens, a small calyx and four white petals. They occur in large and showy panicles that emerge with the leaves from terminal buds. Pollinators are mainly syrphid flies and small beetles, but some pollen is also spread by wind. The species is morphologically androdioecious (Dommée et al. 1999, Wallander 2001), which means that some trees carry only hermaphroditic flowers and others only staminate ones. The staminate flowers are functionally male as their pistils are rudimentary. Recent work indicate that it might not be functionally androdioecious (Verdú 2004, Verdú et al. 2004, Verdú et al. 2006). See also the work by FRAXIGEN (2005). Drawing of flowers and leaves from Köhler's Medicinal Plants. 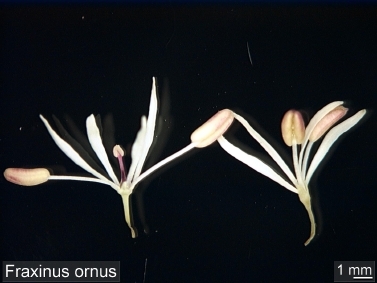 Flowering biology of a wind-pollinated European species: Fraxinus excelsior (common ash). Photos © by Eva Wallander. To see a larger picture click on the small ones!